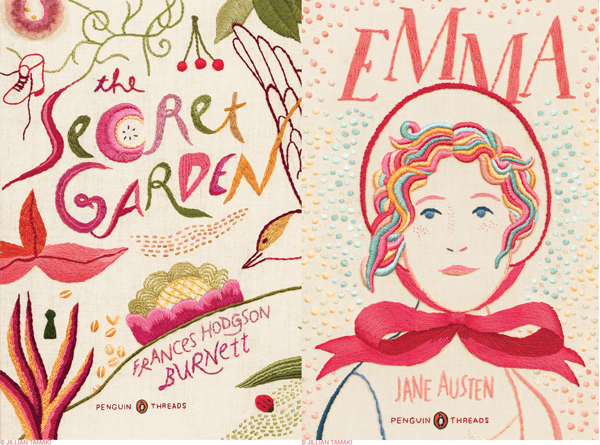 Today's favorite moment (besides snug-a-lugging with our girls) is when I clicked on a twitter link from Design Sponge + Jessica Hische and instantly became mesmerized by these stunning embroidered book cover designs for Penguin Books by Jillian Tamaki! They are gorgeous, gorgeous, gorgeous! Wouldn't you agree?! The titles, Emma, The Secret Garden and Black Beauty couldn't be more perfect either. We will all have to wait a while to get our hands on these babies, sounds like November, but it is a dream to be able to see such talent and work in progress! Jillian's other work is incredible too, like this Monster Quilt -- Gasp! Beyond her apparent beautiful embroidery talents, she is a illustrator and comic artist who lives in Brooklyn and also teaches at the School of Visual Arts. black beauty and secret garden were two of my FAVORITE books as a child. these covers are gorgeous. thanks bringing up warm fuzzies! These are so beautiful and FUN!! I always enjoy seeing alternative cover art. Thanks for sharing! These are so fantastic!! Thanks for sharing! yes, these are amazing! i love the secret garden one especially. and that quilt! i would love that for a little boys' room. These are fantastic! I wonder how they'll be presented... as wall art? Pillows? Embroidery is such a perfectly beautiful art. Oh dear, I absolutely love these! I wish I had enough patience to embroider large pieces like this. Beautiful detail! Lovely, I especially love the Secret Garden book! I already own a copy but I may need to splurge on another just because the book is so pretty. These are beautiful! I love my Jane Austen books and "Emma" is one of the few I didn´t read yet, so I have to get my hands on one of these!